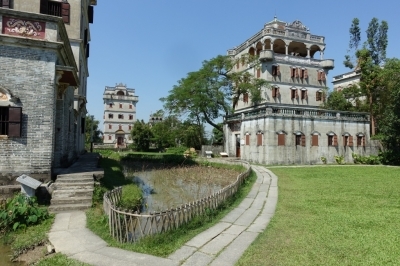 The diaolou of Kaiping are fortified multi-storey towers, built by returning Chinese immigrants from America, Canada, Hong Kong and Malaysia. They display a fusion of Chinese and Western decorative forms. The towers were constructed in the 1920s and 1930s, when there were more than 3,000 of these structures. The diaolou served as housing and as protection against forays by bandits (and later the Japanese). Three separate forms can be distinguished: communal towers, residential towers and watch towers. 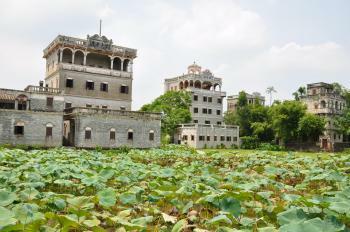 Kaiping is a city about 2 hours south of Guangzhou by bus. From there, I took a taxi to the first cluster of diaolou: those at Zili Village. I can testify that tourism definitely has arrived in Zili. An entry fee to the village of 50Y is charged. There's a car park large enough for a couple of buses. There might have been at least 200 other (Chinese) tourists around when I visited. The villagers seem to almost have given up farming. However, the diaolou here are plentiful and pretty. They somewhat resemble medieval castles. My next stop was Li Yuan (Li's Garden). This is not part of the WHS, but a park with some diaolou created in the 1930s. I started to walk there from Zili, it's only a couple of kilometers and you pass the Fang Clan Watch Tower on your way. After a few minutes I was caught up by a rickshaw, which driver's call I could not resist. Li Yuan itself is good for lunch, but bring your own food. It's very touristy, they even have a jade store! Finally, I wanted to go to Jinjiangli where supposedly the most elaborate diaolou can be found. My rickshaw driver tried to persuade me to go to Majianlong (because that's much closer), but we headed off for the 15 kilometer to Jinjiangli. What a different experience from Zili! Getting there is half the fun. 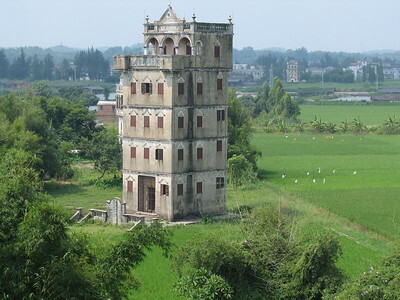 You can see the tower of Ruishi Lou from afar, but how to get up close? The driver asked directions from some mahjong playing women, but that landed us on a deserted country road. There we met the passengers of three more cars with wannabe visitors who were conferring. They had found or arranged another car that would lead the way. The rickshaw only had to follow them, which isn't as easy as it sounds because a car is much faster than a rickshaw. But they waited fo us at corners. At last we arrived at a pretty village, built like a fortress itself with narrow streets. Although there were maybe 50 houses, all was very quiet. Only the loud cuckling of chicken could be heard. The three dialou here are at the back of the village. A woman at the door of Ruishi Lou asked an entrance fee of 20Y, but there might be no fee or a closed door another time. The house belonged to her family, if I understood her well. This one has nine stories (the most of all), and is more furnished. The family pictures are still there. It's a pleasure to climb to its highest floor and the roof balcony because of the lesser number of visitors. From there, there's another good view of the village (and its chicken). Pulling into Kaiping by bus from Guangzhou I saw my first Diaolou. What a weird mix of castle tower and appartment building with some Asian decorations added to the mix. 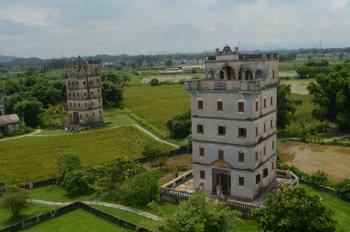 You will find the whole landsccape around Kaiping dotted with these structures and plenty of photo opportunities. The site itself covers three representative examples of this architecture. I started my visit in Zili, probably the most touristy one of the three villages. The premises and facilities indicate that they are devised to handle way more people than the few that showed up end of October. Zili is nice to explore with some buildings open for visitors. From the inside these look rather mundane, but this is to be expected. Obviously, you want to climb one of the towers for the view and photo opportunity. After Zili I went by shuttle to Majanglong. Majanglong is surprisingly large. In the end I needed to hurry to catch my shuttle bus. Majanglong feels more like a true village. It's also the less touristy one, so I really enjoyed my time there. The individual buildings, though, are more spectacular in Zili. Looking at Els review from 2007, things have changed dramatically. The Chinese have put in place a serious tourist infrastructure with combined tickets, a shuttle service instead of rikschas and plenty of restrooms. In Majanglong it felt there were more restrooms than tourists that day. China is changing fast. Last but not least a few words on the merits. This is 20th century vernacular architecture by nouveau rich Chinese, some of it quite kitschy. It's fun to visit, but more as an oddity than as a architecture masterpiece. Kengkou Subway Station is easy to reach. From there the bus station is well sign posted. The bus ride from Guangzhou to Kaiping (Yici Terminal) took 2h. The return took a bit more as we got stuck in a Guangzhou rush hour traffic jam. The bus stand in Kaiping for bus 617 is labelled and easy to spot. It's the first booth in the departure area for local (= numbered) busses of the Yici bus terminal. The number is also displayed on the bus itself. Initially, the bus does a few weird detours in Kaiping but it gets you to Zili and Li Garden (Li Yuan) in 30min. You will see signs on the highway, so you know when to get off. To return you just wait on the opposite side of the road and wink when the bus passes. In Kaiping I had to wait 15min for the bus. On my way back it took less than 5min. For returning to Guangzhou you have multiple different terminal bus stations to choose from. I opted for a return to Fangcun, my original starting point. Looking at the terrible traffic in Guangzhou it seems smart to get on the Metro as soon as possible, i.e. to take the most westward bus terminal. Bus 617 takes you directly to Li Garden (not part of the site) and Zili. The other components are more than 10km away, so walking is not really an option. Luckily, the sites operate a shuttle bus that connects Li Garden, Zili and Majanglong Village every 1,5h. The shuttle is included in the combined ticket (180 CNY). If you time it right, you have an hour each at both Zili and Majanglong. The schedule is posted at each stop, so please confirm the times yourself. My recommendation would be to start in Zili then take the shuttle to Majanglong and end in Li Garden before you return to Kaiping and Guangzhou. If you want to go to Jinjiangli Village my understanding is that you can take a regular bus along the main road to take you there. As stated Li Garden is not part of the inscribed site. I think the reason is that this is too Western with too few Asian touches added and as a consequence not very original. If you get the combined ticket the site is included and you may well take a stroll. The shuttle also stops for a few more sites that you may want to check out. In August 2017, I traveled by bus from Guangzhou to Kaiping, where there were several taxi drivers awaiting to take travelers to visit the local sites. I had used my iPhone to take screenshots of the locations that I wanted to visit, and was able to negotiate an excursion with one of the local drivers. I visited two of the villages, beginning with Zilicun, where the largest group of watchtowers stands scattered among rice paddies and where I was joined by a few dozen tourists. I also visited Jinjiangli village, which is home to three well-preserved towers and where, aside from a few elderly residents engaged in chores and ablutions, I had the village to myself. On the way to Guangzhou from Hong Kong, I decided to take a four hours direct bus to the city of Kaiping to see the famous Diaolou, currently a sole cultural world heritage in the heartland of Cantonese. It is very easy to take a bus to Kaiping; there are many bus companies in Hong Kong; however the routes and bus conditions are quite different. I used Trans-Island since its air conditioned buses seem to be the best. On the bus I made many new friends who wondered why a foreigner wanted to visit Kaiping. With my broken Chinese and I had only four hours to catch a next bus, one Chinese guy on the bus decided to help me tour Kaiping and a town of Chikan for FREE! At Kaiping, my new friend took me to Zili Village, a part of WHS. On the way I was quite surprised to see many Diaolou buildings, before I came here I thought Diaolou to be rare and unique buildings, but turned out that there are hundreds or maybe thousands of Diaolou, as all new housing estates were built in Diaolou style! At Zili Village, I had to buy a ticket to enter the village, the village was located in the middle of rice paddies and ponds, and there was a nice long wooden bridge connecting ticket office to the village. The surrounding landscape seems to be redesigned for WHS beautification. At the middle of the village, there was a very photogenic lotus pond with Diaolou buildings as the background and WHS sign. Inside Diaolou, the uniqueness was visible with thick iron doors, iron barred windows, and many defensive elements; Diaolou was truly a little fortress. Western decoration on the top of building was another special thing for these Diaolou. In my opinion, Diaolou is a melting pot of architecture which is also happened in many shophouses in Southeast Asia. A unique appearance of fortress-tower liked with western art on the top is truly outstanding. After Zili, I continued my trip to Chikan, not part of WHS, but a beautiful town of colonial buildings, a nice place to visit. Then I back to Kaiping to take a bus to Guangzhou. Apart from the hotchpotch architecture, I really touched with local hospitality and made my day memorable; Kaiping Diaolou is a very interesting UNESCO World heritage Site of China. I visited Zili, Majianglong and Jinjiangli in January 2010. Before I had set out on my journey to Kaiping, I was of the impression that I could rely on the local buses to get me to where I wanted to go. The Kaiping website made it all sound so easy. I was quite sure that I would easily reach Zili from the coach station by local bus. But no one told me that I would be told to alight at a stop 4 km away from the village. So yes, I trekked the entire 4 km to the village. Anyway, my point is, do not trust that the local buses at Kaiping. You will be much better off hiring a driver. And that was what I did. In fact it was the driver who found me. I hired him on the spot! As for the diaolous, I have to say that I am glad they have been inscribed. Besides their roles as village fortresses, they also represent a part of Chinese culture which was before their inscription not represented at all on the list. This is something like Chinoiserie in reverse. I too met a lady at Ruishi Lou and I should think she was the same one Els had met. Her husband is the 4th generation owner of the building if I remember correctly. She gave me a quick introduction of the building and then charged me 30Y for it. I sure hope she had told me more about the place than she had for Els! But she did give me a nice photograph of the building. A Japanese friend and I went last January. Kaiping is warm and sunny even if it's winter. We went to Ruishi Lou, Zili Village and Majianglong. Best way to see all the sites is to hire a private car. Two buses leaves for Hongkong everyday (four hours away). Fusion: "fusion between Chinese and Western architectural styles"
Guangzhou hotspot: Take Bus in Guangzhou East to Kaiping YiCi (2-2.5 hours). Then take minivan to scenic area (less than 1 hour). 82 Community Members have visited.